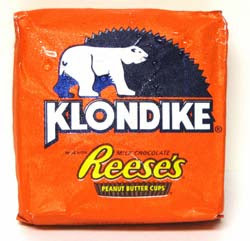 Rabbit In The Headlights: What Would You Do For A Klondike? I went winter camping when I was 14. we FROZE, despite our multiple preparations, and in the morning, there was ice on the inside of our tent (the condensation from our breath froze on the top of it). It was awful. It's about time that he took his turn camping in the snow!!! I like camping and all, but really don't see the appeal of camping in the snow. Sounds like pure misery to me. The Reeses Klondike on the other hand sounds intriguing. If "The Office" is going to continue its raunchy streak you're going to have to step up the posts as you will be my only source of comic relief.....my therapy. Seriously. Oh my those look good. Camping in the snow not much fun. However, Jeremy gets to do that in two weeks. Maybe I'll pick me up some Klondikes! Good morning, former neighbor. Thought you might enjoy this video. I'm going to enjoy what time I have left in my gas guzzler!